There are a lot of things I could be writing about on this blog, only for lack of time. And one of them is food. Sometimes I think there are two types of people in this world... those who love cooking and those who think it is a chore. I am glad that early on in my life I took the positive path and decided to have as much fun making a meal as I do eating it. This doesn't mean that every day I cook a gourmet feast, though every now and then I have the chance to come close. As an example I'll use a dish everyone knows, the impossible-to-stop-eating signature noodle dish. Pad Thai should include little dried and fermented prawns (shrimp for you in N.America). They give it a salty zing that works well with the rest of the flavours. You can certainly buy these mummified oddities, in dozens of varieties, from the many Asian food markets of Toronto (including the Spadina and Dundas Chinese/Vietnamese area). But I'd like to know a single restaurant who include them in their food. I really would like to know, for my next visit. On this particular island, Thai green curry is a popular dish, with many Chinese and mainstream restaurants including it on their menu. This is one of the oddities of food in Ireland. But I imagine it's because the Irish love dairy and hence creamy foods; the coconut milk base appeals to their sensibilities. Perhaps it goes without saying that I have never found a decent Thai green curry, let alone an amazing one. They are almost entirely lacking in flavour, which rather defeats the purpose. So, when I say that my Thai green curry is the best in Ireland, I am in fact making a modest claim. And last night I happened to make the best batch ever, which is what kicked off this little article. Because you can too! It's easy, because you can cheat. By cheating, I simply mean that you can employ a pre-made green curry paste. Simply ensure it is a decent one, made in Thailand. You will likely see Dutch on the label, since Holland is the most likely to import Thai products into Europe. With all luck there might also be English. I use Mae Ploy brand. A 1kg tub cost me only 4 Euro, though I've had it so long I don't doubt the price has gone up in the interim! Here's what it's made of: 31% green chilli, 21% lemon grass, 18.5% garlic, 12.5% salt, 8.5% galangal, 4% shrimp paste, 2% kaffir lime peel, 1% coriander seed, and 0.5% each of pepper, turmeric, and cumin. That said, I would never rely only on a paste, but instead supplement it with as many fresh ingredients as possible. I wish I could tell you how much of each ingredient, but that depends on how crazy you like your food. And I never measure or take notes. But I do sometimes take photos, and so here are some of the ingredients laid out. The bowl at the bottom of the picture contains diced lemon grass and a very hot red chilli. One way you can control this is to include a whole chilli, so the flavours seep out of it and the pod itself can be avoided. But around here we like things spicier than that! Clockwise is diced ginger (since I had no galangal) and garlic. Then some whole garlic to show the variety I find most convenient. The cloves are solid so there is far less peeling. The next bowl contains some prawns and lime sliced ready for juicing. I used a whole lime though not all made it into this shot. Let me state the obvious: lime is not the same as lemon. Then one whole large white onion diced and, just visible, some sliced red pepper. At the top of the frame is a bowl of fresh coriander AKA cilantro, and two fillet of meaty white fish. In this case I used haddock, which is under-rated IMO. People keep buying cod despite the over-fishing, which is silly. Try something different for goodness sake! Of course haddock is likely not much different in terms of stock conservation but let's not wade too far into guilty waters here. Not included in the shot are baby corn and green beans, both par-boiled. Include what veg you like. 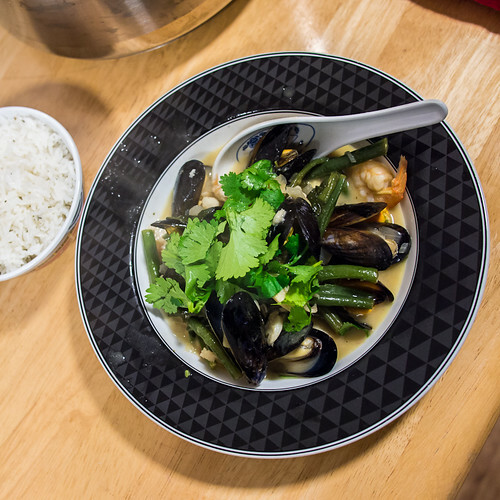 Though some work better and are more often found in a green curry than others. Also not shown is the red wine, which should be opened while cooking and consumed slowly throughout the process. Opening wine at the table once everything is done is nothing less than a waste of good drinking time. Bottom line: Yes, I used a paste, but then topped up at least four of the flavours with fresh ingredients. This is the "secret" technique! In a little vegetable oil fry the onion until translucent (same as ever), then add garlic and ginger, then chilli and any other spices. 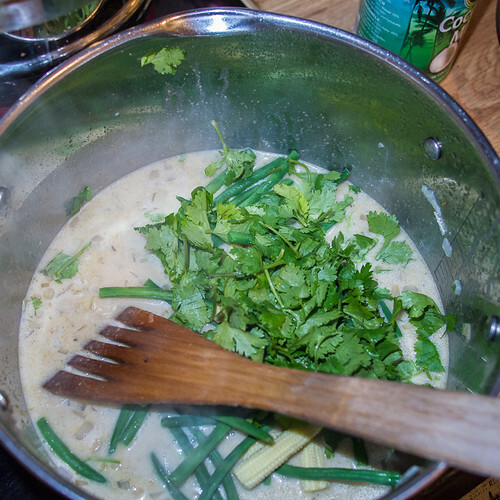 Add the green curry paste and make sure it is well distributed, as it tends to stay in clumps. How much? Hmmm.... that is up to you. Start with a tablespoon. Add in a tin of coconut milk. And for heaven's sake don't buy a "light" variety or anything silly. It's been diluted with water -- you can do that yourself if you want to. Normally I wouldn't, but in this case I needed more liquid to cover the mussels. So I added some vegetable stock, a cup or two. OK, now toss in the corn, beans, pepper, cilantro (some not all), and whatever other vegetables you have. I now need to mention two further ingredients. Yes, I've been holding out on you. First, fish sauce. This is fermented and very stinky, but brings flavours alive. You will not want much while getting used to the flavour, maybe only two shots. But you really cannot avoid having at least one real fermented fish product in a Thai dish. So don't avoid it! Second, I use some "oyster" sauce, as a thickening and sweetening agent. It may or may not actually include oyster extract. The cheap ones or those brands made to be vegetarian don't. Make sure yours does, or just get a mushroom sauce if you don't eat meat... in which case why are you reading about a seafood recipe? Anyway, I use only a couple of dollops in this particular dish. It's not Chinese food so I don't want the oyster sauce to be discernible as a flavour in the final dish. But like the fish sauce it makes a real difference. Finally, squeeze in (almost) all of that lime juice. Stir and simmer. When things have come together and reduced a bit, it's time to add the seafood ingredients in proportion to how long they need to cook. 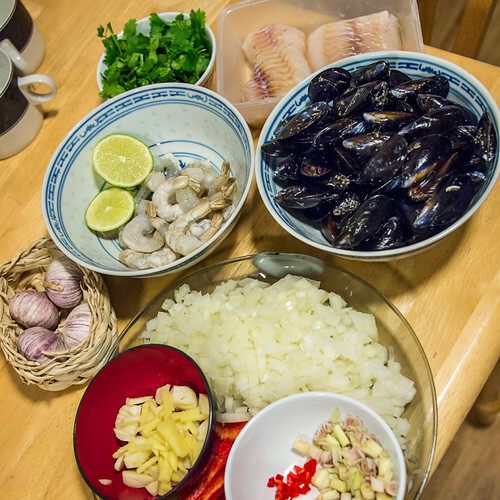 First I put in the white fish, then prawns, and lastly the mussels. They only need 5-7 minutes. They are done when they open. Discard any that don't. Never pry open a mussel to eat it! Serve in a bowl with sufficient sauce/broth. Top with fresh cilantro. Squeeze on some fresh lime. Add a tiny fresh killer chilli if you like. Have some rice on the side, preferably jasmine. Eat, mop your brow, drink wine, have a good time. It's very healthy food and will flush out toxins, fight cancer, and cure colds. (All proven, by the way.) If we ate more like the Japanese, Indians, and Thais we'd be a lot happier. Susannah and I are certainly happy each time we indulge. This recipe goes out to her, since it was our wedding anniversary meal. I've made some pretty good green curries in my time, but this was the best ever! I am very happy to report that in the three years since writing this, great Thai food has come to Ireland! In Limerick alone we have six restaurants that claim to serve Thai food. Two of these are worth a visit. Aroi is a cafeteria style "Asian street food" joint, where every plate is ten Euro. The flavours are perfect and, yes, there are little preserved prawns in the pad thai! Best version I have had in twenty years! Kaya is more expensive but has a wider menu. The beef salad is to die for, but be sure and specify "spicy". I made the mistake of saying the same for one of the main courses and suffered for my folly... it was Thai authentic hot. We are now spoiled in Limerick for good food.